On Monday, I spotted several turkeys in our backyard, scratching at the seeds that dropped from our bird feeders. I knew that they spook easily. I grabbed my camera and stalked down our driveway to the edge of the house, not an easy feat on a gravel driveway. To my surprise, there were over a dozen turkeys in our and the neighbors’ yards. I fired off a couple shots before they spotted me and flew away toward the wooded ravine behind our house. All winter long, we did not see a sign of them but now that the days are getting longer they will probably show up more often. 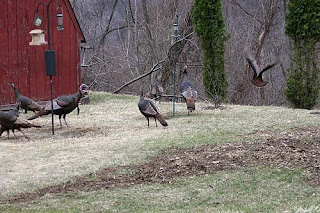 Years ago, I even saw a turkey landing on top of our feeder pole. More dangerous was the time when I observed three turkeys crossing the street toward the school that abuts our housing plan. Where they after the food the children dropped on the ground or did they want to attend turkey school?